Digital Marketing Labs' Special Report ill help any independent writer use Amazon Kindle to self-publish their e-books. The article said the report walks potential self-publishers through the steps involved in the lucrative e-book world, where digital content has begun to change the cultural reading scene. Since Kindles put shelves of books into the palm of a hand, their popularity has driven them to catch print books in terms of sales. As modern technology continues moving towards small, lightweight, extremely capable pieces of equipment, paper and ink will become a thing of the past, claimed the article. “Partnering with Amazon” will give not only advice on the submission and publishing process, but also on the aftereffects, which can be enhanced with certain tips and strategies. The report covers the best available and helps creators optimize their listings and increase search engine rankings on demand. Plus, for the independently-owned business who wishes to gain access to Amazon’s customer base, the Special Report will show them how to get people from their Amazon Kindle publications to their business’ website to sell them other things. The customers on Amazon have their accounts on file with a secure retailer they trust, allowing for instant and immediate purchases. Products are digital on the Kindle, so profit margins from those purchases are 100% after Amazon’s minor commission fee. Being digital also leaves room for adjustments to content, price, or description and makes those aspects as flexible as can be, said the article. 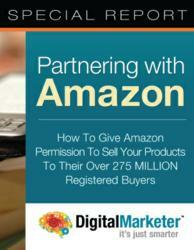 “Partnering with Amazon” shows how businesses or authors can become the number one search result for their specific niche, giving authority to the company’s brand and identity. An Amazon listing gets boosted up the ranks because it’s making money, and the aftereffects are just as valuable, according to the article. The useable information in the Special Report is part of Digital Marketing Labs’ devotion to helping individuals and businesses market themselves and their products with the most success. To find out how to use Amazon Kindle to self-publish an e-book and get the plan for optimum success, “Partnering with Amazon” is available now from the Digital Marketing Labs.